Forecast for record quarterly DRAM sales of $21.1 billion, with 74% annual growth expected. 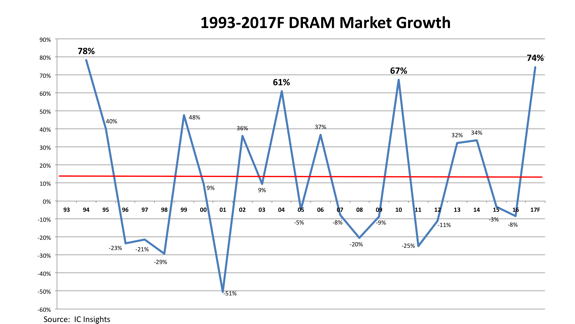 Annual DRAM market growth of 74% is forecast for 2017, which would be the highest growth rate since the 78% increase in 1994—23 years ago—and 61 points more than the 13% average DRAM market growth rate from 1993-2017 (Figure 2). The expected 74% DRAM market growth in 2017 will mark the fourth time since 1993 that the DRAM market has increased by more than 50%. 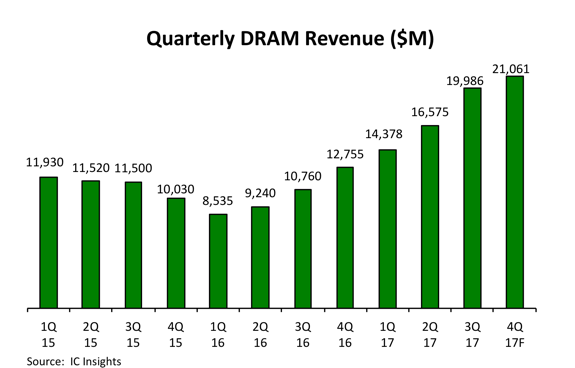 This near-historic high market spike in 2017 was brought on by several factors, including constrained supply attributed to a lack of major fab expansion plans, yield difficulties with leading-edge (≤20nm) processes, demand for high performance (graphics) DRAM from gaming systems and data center-based server applications, and increased average content for mobile DRAM used in smartphones. There is an increasing need for high-speed but inexpensive data storage in smartphone handsets for multi-tasking, which is boosting the average DRAM content in a smartphone. The Apple iPhone 8 features 2GB of DRAM and the iPhone X has 3GB of DRAM. The Samsung Galaxy S8 is sold with 4GB of DRAM (6GB in China). Huawei’s P10 Plus, and HTC’s U11 come with 6GB of DRAM. The One Plus 5 model and the first smartphone from Razer, a Singapore-based company that is primarily known for its video game equipment, have 8GB of DRAM. With virtual and augmented reality and artificial intelligence becoming prominent features on new smartphones and apps, DRAM content in high-end smartphones shows no signs of slowing. Meanwhile, DRAM growth for smartphones is also stemming from less developed countries, where much of the population is moving from feature phones to their first smartphone—literally transitioning from zero to 1GB of mobile DRAM. Based on historical trends, the DRAM industry will likely experience a decline (possibly a big market decline) in its growth rate in the not-too-distant future as prices begin to tumble with significant capacity additions and an increase in DRAM output expected over the next year or two. Announcements by Samsung and SK Hynix in the second half of 2017 confirmed that new DRAM capacity is set to come online in 2018, which likely will ease the upward trend of DRAM ASPs next year. Samsung has stated its semiconductor capital expenditure budget for 2017 will be an enormous $26.0 billion, and SK Hynix has announced plans to build a new manufacturing line at its massive facility in Wuxi, China. Micron has gone on record as saying it doubts that it will ever need to build another new DRAM fab, but it is hard to imagine that Micron will sit still as its two fiercest rivals capture additional marketshare. (For the record, Micron and Intel are developing Crosspoint memory as a potential replacement for DRAM).